بالأمس حضرت الندوة التى دعا إليها علاء عبد الفتاح للتوترجية (الناشطين المستخدمين لتويتر) التى حاولت ان نسلط بعض من الضوء عن تصور “الإسلاميين” عن السياسة و الحكم فى مصر. و كان هناك خمسة متحدثين رئسيين من شباب الإخوان، أربعة منهم أنفصلوا من الجماعة و الأخر مازال عضوا بها و ذلك بالإضافة للحضور الذى كانوا من الأطياف متعددة (سلفيين، لبراليين، يساريين، أناركيين، و غير محددى التوجه). كيفية إعادة جو الثقة على مستوى واسع (اكبر من حضور الندوة) و ذلك بعد ان اصبح هناك جوا من التوجس من الأخر مستشرى فى أطياف المجتمع المتعددة. تبين جلياً فى هذا الندوة انه عندما نتحدث بعضنا لبعض بعيدا عن خنادقنا الفكرية يمكن ان نخلق أرضية مشتركة للتوافق. 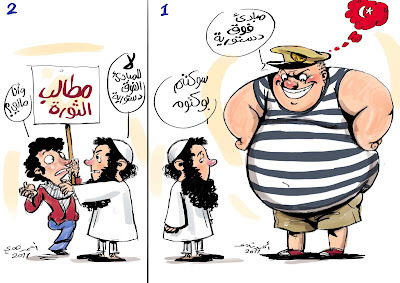 التواصل على المستوى الإنسانى أهم من المبارزات الفكرية. We are under attack and our dreams are under siege. After a little over three months it is becoming deadly clear that certain forces are trying to outflank us, and they have already had some success. We must regroup now or all is lost and noble sentiments and aspirations that we experienced will be nothing more than a fading memory. The stuff of lamentations over what could have been and how we it let slip our grasp. Some readers at this point might object: What are you whining about? Why this talk of gloom, conspiracy and dark forces? Shouldn’t we be focused on the upcoming parliamentary elections? Mubark, his sons, and wife are facing charges of corruption (though no criminal charges have been pressed yet). We have temporary constitution that limits the power of the president, and the duration of his/her presidency (never mind that it gives the supreme councle of the armed forces [SCAF] unchecked power for the time being). We have some sort of road map for democratic transition where we are having parliamentary elections in September, followed by presidential elections six months later. We have Prime Minster who supported the revolution, and who many still believe is genuinely a decent person (though many have doubts about his ability to assert the demands of the revolution). So why complain? Can’t we just hold-on for a few more months and get the representative parliament of our dreams and then a few more a get an elected president? The SCAF and government seem to be telling us to do just that. They don’t seem to like people expressing any sort of complaints or grievances. They even managed to pass an anti-protest law!!! Quite ironic, after a revolution. It all boils down to a crisis of trust. In the early hours of the February the 26th, I stood with a couple of hundred revolutionaries in front of the People’s Assembly building. 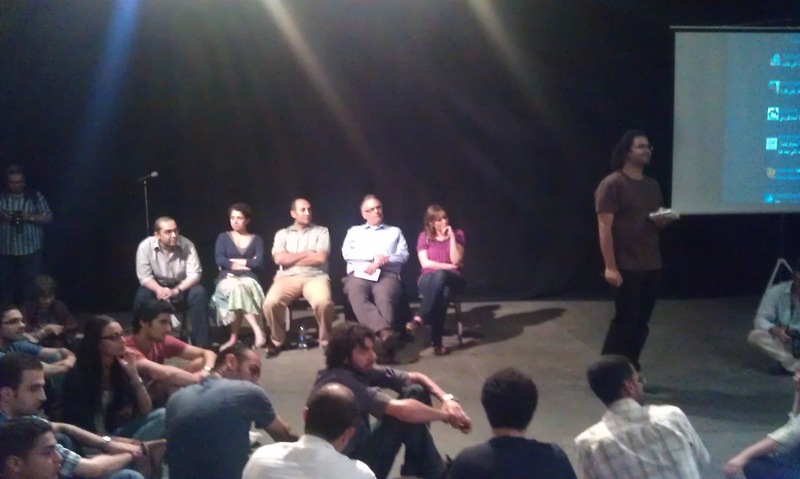 We were all gathered for sit-in, demanding that Shafik and his cabinet step-down. 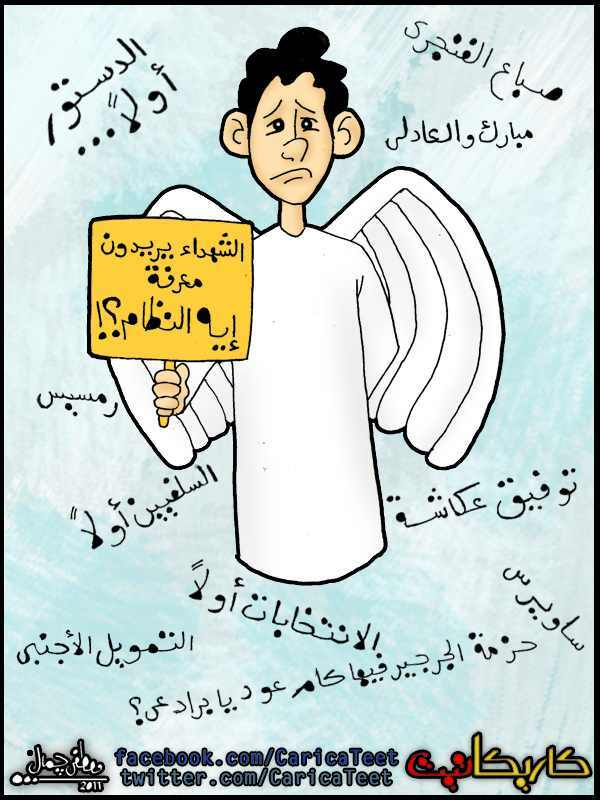 This was the same cabinet that Mubarak put in place in his last days and that the SCAF had kept for mysterious reasons. That night many of us were severely beaten, electrocuted, and subject all sorts of abuse. In one harrowing account of the torture that went on that night, it is clear that many in the army are still loyal to Mubarak. The army officers reveled in forcing the protesters to cry “long live Mubarak”. I was lucky to have escaped being captured, I was running and hiding in nearby streets. The SCAF tried to deny any wrong doing and often declared that it never incarcerated any of the protesters. Their narrative does not hold much water, and runs counter to the many eye witness accounts. The SCAF has shown itself very trusting of the late regime’s corrupt figures. This was clearly demonstrated in the appointment of the governors, many of who were from the minister of interior who were notorious for their involvement in torture cases, and others who have often spoken out vocally against the revolution. The SCAF reputation now reeks of anything to but trustworthiness. I firmly believe it becoming exceedingly hard to see them as honorable custodian of our revolution. Their decision making is opaque and their actions are far from comforting. It is very hard to explain how the army highly trained special forces were being used to hunt and incarcerate protesters while idling when churches were being burnt or peaceful protesters were being shot at. Why regroup, why a second Friday of Anger? The SCAF has proven itself to be at best incompetent in helping achieve the demands of the revolution, and at worst having designs on post revolutionary political landscape to serve the best interests of the SCAF generals. The SCAF generals maintain massive economic interests and no civilian oversight. One can see that it would be hard for generals to abandon many of their perks for the greater interest of the country. I find it very suspicious that a supposed scholar like Moataz Abdel-Fattah tries to push forth the notion that SCAF is totally immune to ambitions of its generals and that there is something, that almost veers on the supernatural, the will make them the honest executors of the people’s will. Recalling the faces of the soldiers chasing in on February 26th and their determination to capture and torture makes me immune such flimsy (or more likely disingenuous) arguments. What do we do? 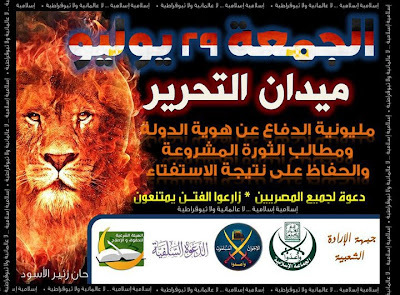 Fire the SCAF? The SCAF for all its sins still maintains a semblance of stability and yet we would never trade away our freedom and our revolution for this poor attempt at maintaining “order”. We are pressing forward demands that we hope will keep the SCAF straight, yet those demands are still being worked out, refined and crystallized. Over the past few months a great deal of trust has been eroded and it is about time that SCAF pays attention to the revolutionaries and stop trying to undermine the spirit of the revolution. I am looking forward to May27 where amongst a sea of competing memes, the best ones will dominate. It is best captured in this brilliant graffiti by Ganzeer showing a taking facing of a bicycle. The revolutionaries are doing the difficult act of moving forward while balancing a bread tray over their head. The bread tray is future of Egypt. 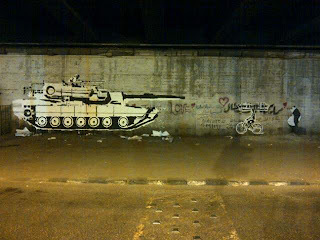 The tank (SCAF) seems to be standing in the way. Together we can force the tank to change direction, and we are far more powerful than what naive sizing up of strength may suggest. During the last two days, I have had the opportunity to examine two groups that are concerned with building a consensus among the revolutionaries and spreading political awareness in all sectors of society. Both groups are working towards achieving the goals of the revolution which I understand to be something that is even greater and nobler than can be expressed in any set of demands. I will try here to shed some light on both groups and contrast their working styles. This group is often confused with the popular coalition of the youth of the revolution (ائتلاف شباب الثورة). It does not really help that there are at least three other similar sounding groups that also claim to represent the demands of the youth. In a meeting with Abdoulah Helmy, one of the founders, I learned that the union was formed after realizing that the coalition was a somewhat closed club that brings together a number of already well organized and well established political groups. Helmy, saw that there are many political groups outside of the coalition and a great deal of politically non-affiliated citizens that need to coordinate activities and work together towards a common goal. He started the union in Tahrir and got many thousands to signup to it. The union is amongst the groups that are frequently consulted by the supreme council of the armed forces (SCAF). The union is a very open group and many of its members maintain other affiliations. They have a head start in trying to work towards and national dialog and to build consensus among members from a very broad ideological spectrum. 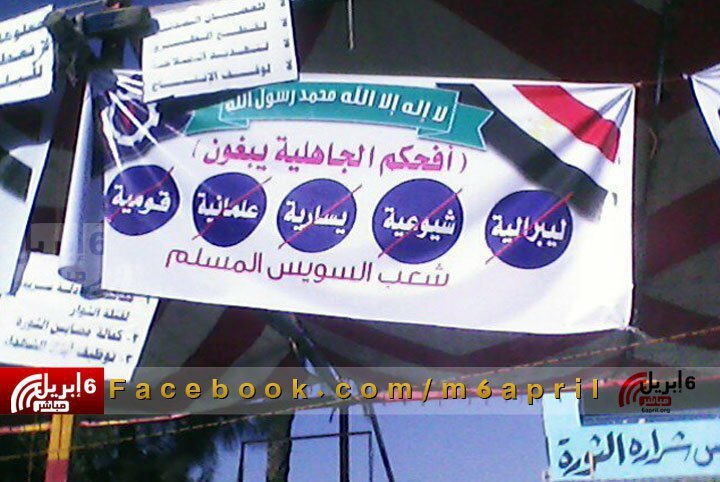 Amongst their ranks are Salafis, Communists, Coptic extremest and everything in between. I was shown a draft of a set of political demands that they managed to get representatives from diverse groups to agree upon. They want to act as a lobbying group that will throw its weight behind parliamentary or presidential candidates that adopt their demands. They build their power on an existing (and growing) network of members and affiliated groups. Their approach seems to be one that is focused on consensus building and quickly adapting to circumstances and the composition of their constituents. The front seems to have started a bit later in the game, as their membership drive only started in full earnestness in last few weeks. Like the union they are an open group that seeks to build unity and a broad consensus. However, they are more focused on the majority the participants in the revolution who are not affiliated with any political group. One can clearly sense that the founders are justifiably concerned that existing political groups might try maximize their political gains while abandoning what they see as the core goals and aspirations of the revolution. The front have a well thought out internal organization and modus operandi. The existence of both the front and the union highlights that there is still something in the Egyptian Revolution that has yet to find a means of expression, something that needs to be established that none on the existing ideological factions can fully cater for. The front’s emphasis on the political non-affiliated and “goals and principles” first approach to building unity is admirable. Equally admirable is that they seem to be more methodological in their outlook and purpose. The union’s heroic efforts in getting ideologically opposing groups to agree on a set of concrete demands is pragmatic coup de grace against the division. The get things done by muddling through thorny issues and difficult events and one gets the impression that they are highly adaptable and initiative driven. I hope that both the front and union would find areas where they could work together for greater effectiveness. Lets see if we can do battle with the counter revolution with a pincer maneuver.